Will usually be within 2-5 working days. Pallets are bulky items and we therefore need to send them freight. Delivery charges are calculated at checkout on the basis of number of pallet spaces taken up on the vehicle (HGV haulage) and the delivery postcode. If your order is placed before 12pm then we can usually deliver Next Day and/or pre-10am so long as you elect the appropriate additional upgrades at checkout. Please be aware delivery is Monday – Friday only. If you order next-day pre-12pm Friday, your order will be delivered Monday the following week. We cannot guarantee that the pallets will arrive dry, as they are often stored outside here and at our haulier’s depot – if this is problematic please call us on 0161 223 4427 to discuss – we will always try and find a solution. Pallets are a bulky item typically weighing between 15-22 kgs each. You need to be sure you can unload them safely. This may involve manual handling. Our Haulier may not be able to assist in unloading and you should make a plan in advance of how you are going to unload them. You may want to allocate a safe area and make available a forklift or other suitable lifting device. Wood is a natural product and as the pallets cannot be job-specifically load-tested no absolute guarantee can be give as to the load bearing capacity of each individual pallet. Whilst the responsibility for ensuring you are using the correct pallet remains with you we would be very happy to advise you as to the most suitable pallet for your needs. Load bearing capacity is always variable as it depends not only on the pallet but also the weight & stability of the load and correct storage, handling and loading techniques. If you are in any doubt please call us on 0161 223 4427 to discuss your requirements, or email us at info@universalpallets.com. The Buy Online range consists of refurbished pallets only at this time. As such the pallets delivered cannot look exactly the same as the pallets depicted. They will always be the same dimensions and as close to the pictured product as possible. If you have a very specific pallet need (based on pallet appearance) you may want to contact us prior to delivery. Due to the bulky nature of the product we can only accept returns if the customer arranges and pays for the haulage, and the pallets are returned in unused, good condition within 3 working days of receipt. This does not apply if the product was faulty on despatch or the wrong product has been sent by Universal Pallets in which case please contact us to make case-specific arrangements. Are you making furniture out of pallets/boards/collars? Lots of people make furniture out of pallets very successfully however we always remind customers that pallets etc are an industrial product and not primarily designed to make furniture out of- as such pallet wood (even brand new pallets) is rough and will need to be prepared by you for use eg will need washing and sanding as a bare minimum. You will need to decide whether to have the pallets heat treated – see notes below on Heat Treatment. Some people don’t mind the pallets not being heat treated at all, especially for outdoor furniture. We don’t recommend this option, especially for indoor furniture. Please remember that pallets etc are sometimes stored outside and/or transported on open top vehicles and as it can be very rainy in the UK – we can’t guarantee that your pallets will arrive dry. Heat treatment means that the product has been subjected to a minimum period of time within a high enough temperature to kill off wood-boring parasites. You will need to Heat Treat your pallets if you are exporting to outside of the EU (or, currently, to Portugal – call us on 0161 223 4427 if you need any advice as the rules are always subject to change). The pallets are stamped with an ISPM15 stamp and technically you should not also require a certificate – but beware – many countries do still insist on a certificate and you should check with your end user whether this is the case. Or request us to provide pallets with an existing HT stamp on – usually a FOC service. This means they have at some point been heat treated but we can’t guarantee that some components eg boards have not been replaced with non-treated board. We can’t certificate the heat treatment. You would need to check stock levels with us first. 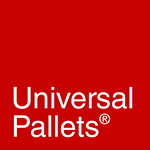 Universal Pallets retains title to the goods until non-reversible payment has been received in full. If for any reason payment is declined or otherwise failed the goods must be returned (in good unused condition) to Universal Pallets immediately upon notice being given, at the cost of the customer.